The Giant Molecular Cloud in Orion. 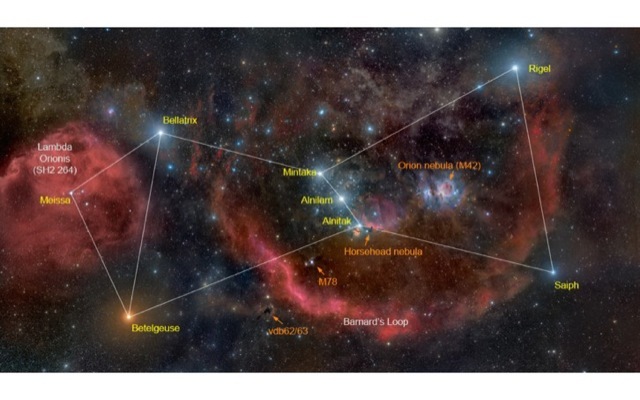 The complex structure of ISM systems in Orion. Credit: Rogelio Bernal Andreo (DeepSkyColors.com). 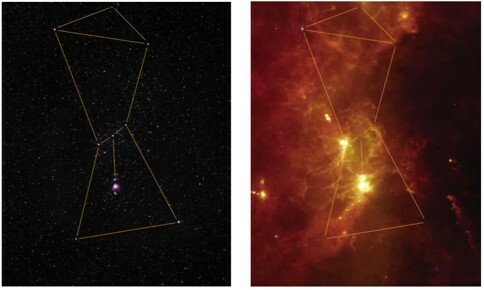 The complex structure of ISM systems in Orion seen by IRAS. Credit: The Infrared Legacy Gallery. 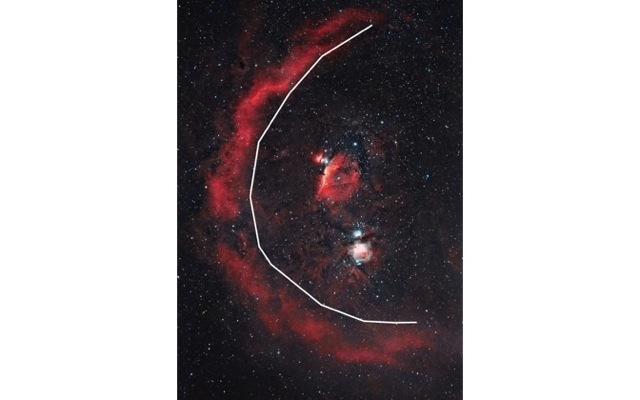 Orion GMC is dominated by the Barnard’s Loop, an emission nebula centered approximately on the Orion Nebula. Size: 600 arcminutes (about 300 light years). Likely originated in a supernova explosion (about 2 million years ago). 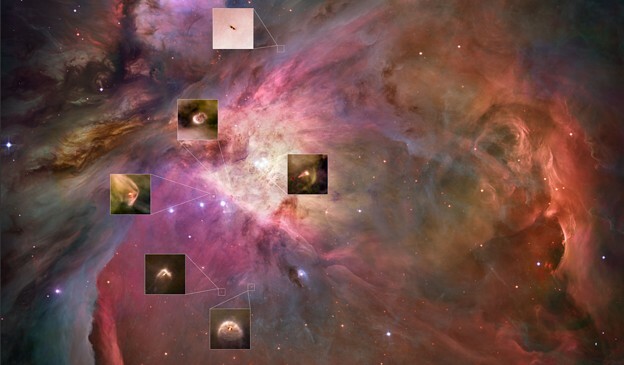 Alternative hypothesis: the winds from bright Orion stars. A wide view of the Barnard's Loop. Credit: Hunter Wilson (Wikimedia Commons). 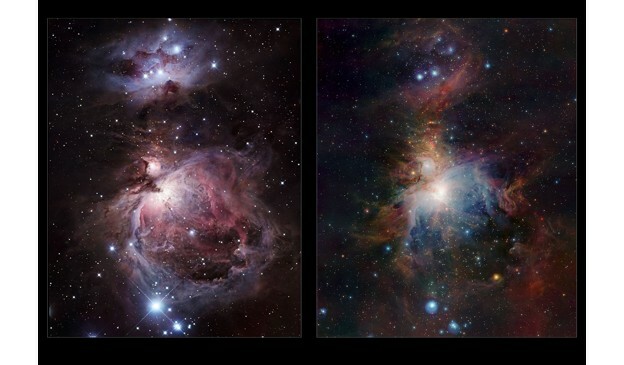 Infrared/visible comparison of the Orion Nebula. Credit: ESO/J. Emerson/VISTA & R. Gendler. 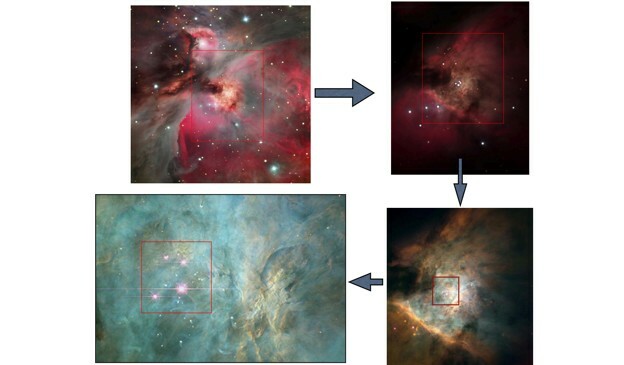 High-resolution images of the region around the Trapezium Star Cluster. Credit: NASA/ESO. 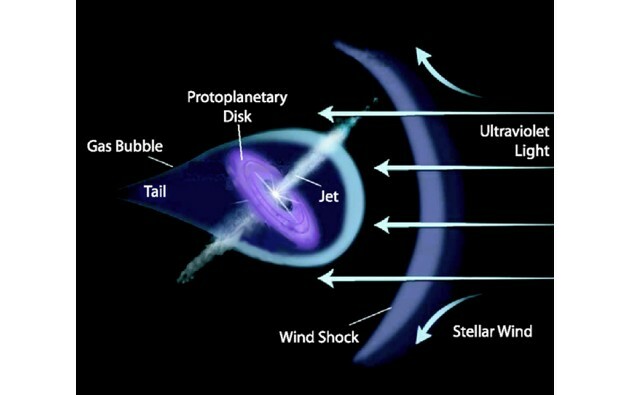 A protoplanetary: is a rotating circumstellar disk of dense gas surrounding a young newly formed star. Therefore, proplyds should not survive longer than years. Proplyds population in the Orion Molecular Clouds. HST image of the Trapezium Star Cluster. Credit: NASA. Model of a proplyd. Credit: NASA. Distribution of proplyds in the central region of M42. Credit: NASA/HST. 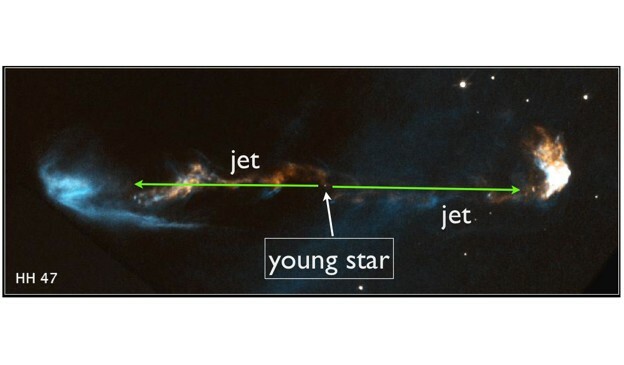 Small emission regions located near the end of high velocity jet-like outﬂows from young stellar objects. Shocked gas: the material in the jet is stopped by the ISM. They are found in star-forming regions, usually seen around a single star, aligned along its rotational axis. 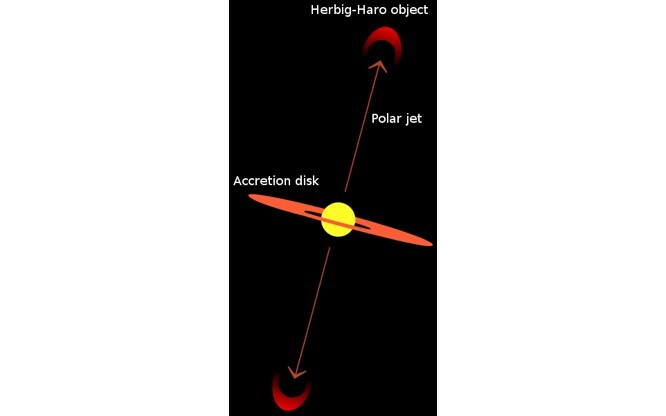 Diagram of an Herbig-Haro objects, showin the accrredtion disk and the polar jets. Credit: Wikimedia Commons. Hubble Space Telescope image of the Herbig-Haro object 47. Credit: NASA/HST. Movie obtained by combing Hubble Space Telescope images since 1994. Credit: NASA. High-resolution images of the HH 901 in the Carina Nebula. Credit: NASA/HST. Best studied star-forming region in the sky. 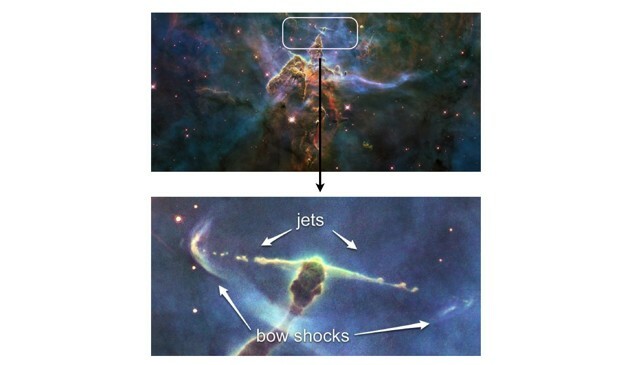 On the detailed structure of molecular clouds. Accretion disk around new stars. 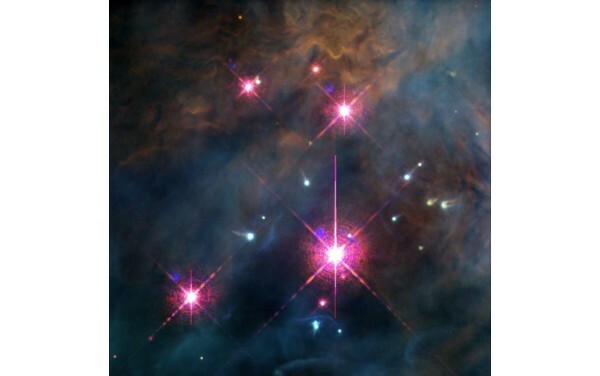 Transient clusters of young stars. Superbubbles created by massive stars. On the formation of massive stars. On the formation time-scale of stars and associations.